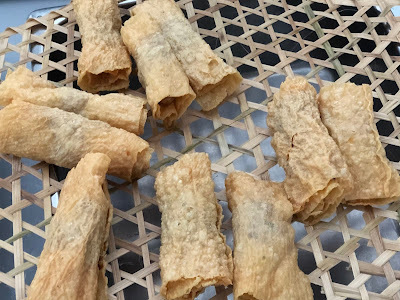 I was happy to finally find a type of bean curd skin or tofu skin ("foo chook") here which turns out well when stuffed and fried the Hakka Yong Tofu way (HYTF). Amazingly, there is a post here on how to make tofu skin. I suppose you may want to take the trouble if are staying overseas where good tofu skin is not easily available. 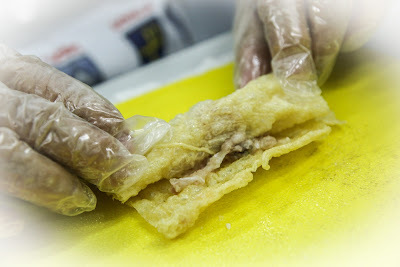 I have previously blogged about the HYTF fried stuffed bean skin. I have since found out that there is a better type of tofu skin which is available here. It is flexible enough to be shaped without the need to wet it first and it comes int eh right square of rectangle shape. Stalls normally sell it in square pieces for recipes like Bak Kut Teh; but I find that to be too small for HYTF. There are stalls which sell them in larger pieces and this is the type I like to use if I am making rolled version. Alternatively, you can also create flat square pieces and have the stuffing in between (see lead photo). If you are doing it this way, you can use the smaller square pieces that are more widely available in stores. 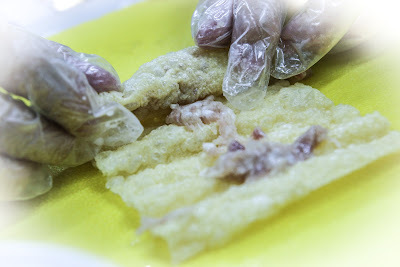 The stuffing is made out of 2 parts fish (batting or mackerel) and 1 part minced pork. I also add some garlic, spring onions and Mui Heong salted fish and minced them altogether on a chopping board with two chopper in tow. I add some salted corn flour flurry along the way. You are not looking for the springy bounce like that found in fish balls. After you mince it into a paste, just slap it a few times so that the stuffing will be tighter. As for the beancurd skin, cut into rectangle pieces in the direction where you can roll it easily. Use the stuffing to stick the rolls together, as in photos below. The deep fry till golden brown. Best eaten immediately after cooking. 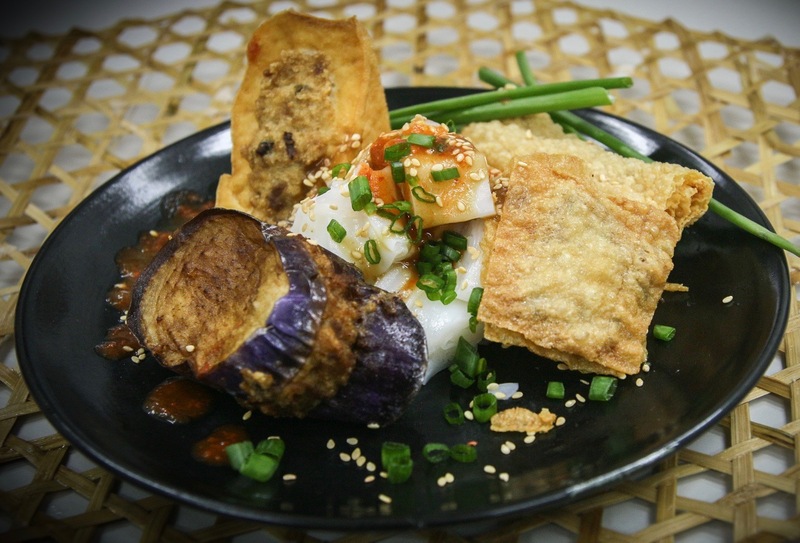 As for the sweet sauce of "tim cheong", check my recipe here. As for the chilli sauce, any plain and fresh chilli sauce will do. This goes well with rice or Chee cheong fun. For my detailed HYTF recipes, check out the posts here.